If you’ve been waiting for some Marvel’s Agents of S.H.I.E.L.D. news to come out of San Diego Comic-Con this year, wait no longer. First of all, Clark Gregg will be back – as the director of the sixth season premiere, if nothing else. (Please, please let it be more than that! #CoulsonLives #StopKillingCoulson) He’ll return to the director’s seat for the first episode, titled “Missing Pieces.” That’s good news. But I for one still want to see him in front of the camera. I guess we’ll have to wait and see if we get any hints about that possibility! Secondly, one question asked in the season five finale has been answered: Jeff Ward, a.k.a. Fitzsimmons’ grandson Deke, has been bumped up to series regular. As you may remember, Deke was last seen leaving the base to go see the world – before the timeline changed. How does his continued existence work with that reset? And what about the implications of one timeline’s Fitz dying tragically? We don’t know those answers yet, but this is definitely intriguing. Plus, Jeff Ward has been a fun addition to the cast. Check out EW’s video at the link above to enjoy their good-natured teasing of the newbie and his responses. 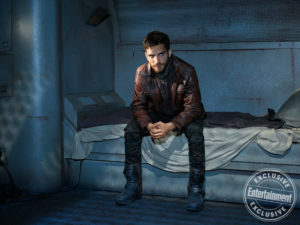 Any theories on how Deke might still be able to show up, in spite of seemingly being erased from existence? Feel free to let us know in the comments! Agents of S.H.I.E.L.D. season six is currently filming, and will air sometime in 2019 on ABC.